I bet many of you experienced some winter snow these past few weeks. In east Tennessee where we’re not accustomed to much snow, we enjoyed a rare white Christmas, with about 5 inches of snow falling and then sticking for a few days. We’ve mentioned before how much our horses love snow (January 2009 horse play) and of course our horses played and rolled in it like a bunch of very big kids. We brought them in at night since they were wet by then and the temps were in the mid 20s and it seemed like a good idea to keep their feet out of snow and ice for part of the day. Of course when we finally let them out the next morning, they bolted from the barn. The picture above is of Cash. It’s HDR so the colors are blown out a little but it illustrates nicely how dirty he gets. That reddish white you see is supposed to be as white as the snow in the background but if you have white horses, you probably know how that goes. 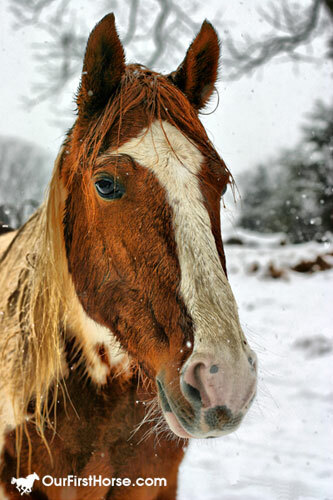 Did you see any horses playing in the snow?